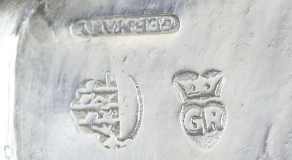 From the middle to the end of the nineteenth century copies of old silver, and items designed in an amalgamation of historic styles, satisfied customer demand and preference. 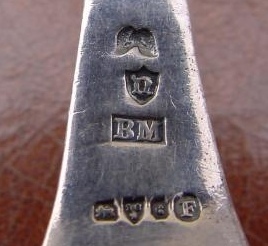 Many firms in Europe and in the United States produced this type of silver. 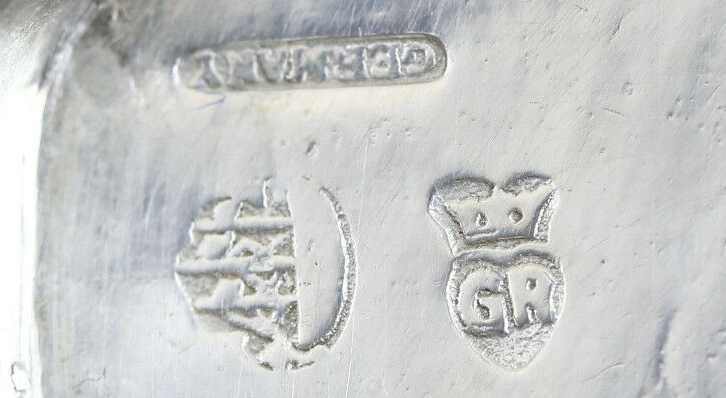 Generally speaking, the recognition of reproduction silver does not present a problem since it is marked according to the laws of the country of origin. 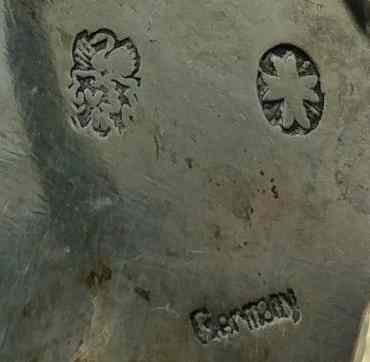 Contrary to this, the antique silver industry of Hanau chose to mark its output with fantasy marks. It is difficult to say if this was practiced with a clear intent to deceive. 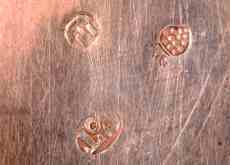 But it is strange that the spurious marks somewhat resemble old marks, and are also harmonized with the style of the piece. 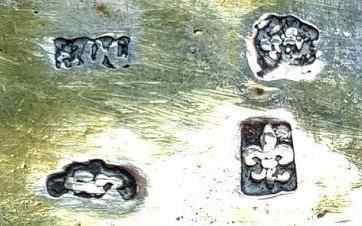 For example, French rococo style reproductions are marked with French looking marks, German seventeenth century-inspired pieces got German-looking marks, and so on. Furthermore, most Hanau firms chose as company marks styles reminiscent of seventeenth and eighteenth century maker's marks. 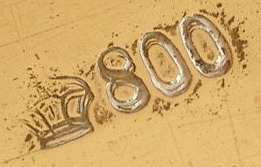 Mark stamping as practiced in Hanau would have been completely illegal in France or England, or for that matter in any other German city where a guild supervised the marking. But Hanau had a long tradition as a free-trade city. 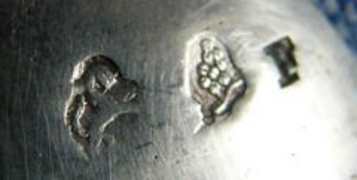 With the production of "antique silver", Hanau found a market niche, which brought its silver manufacturers enormous prosperity and worldwide reputation. The 'father' of this industry was August Schleissner. 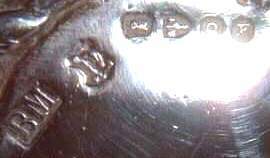 The other leading firm of Hanau was Neresheimer, founded in 1890 as a partnership of August and Ludwig Neresheimer with Jean Schlingloff. Right from the start Neresheimer offered a wide range of highly decorative objects like nefs, tankards, coconut and nautilus cups, and other sumptuous sideboard pieces. 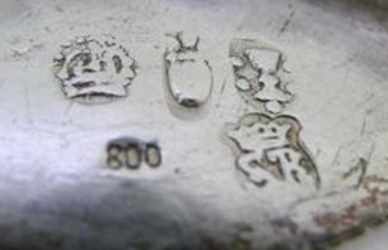 Hanau marks aren't registered trademark but the mere reproduction of ancient silver hallmarks. 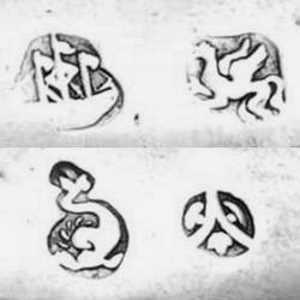 Similar symbols were used by different manufacturers and familiar or economic interaction between various Hanau firms could be at the base of marks crossover. 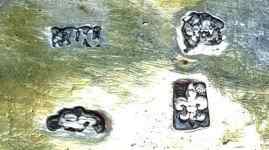 This explains the uncertainty in the attribution of many "Hanau marks". Jacob Stork and Louis Sinsheimer. 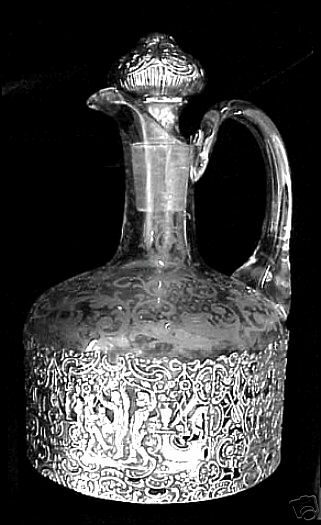 Hanau silver was largely imported in UK between the end of the 19th and the beginning of the 20th century. Berthold Mueller was an import firm, who distributed a lot of Neresheimer silver - see John Culme: The Directory of Gold-and Silversmiths, Jewellers and Allied Traders 1838-1914, Vol.1 page, page 335. 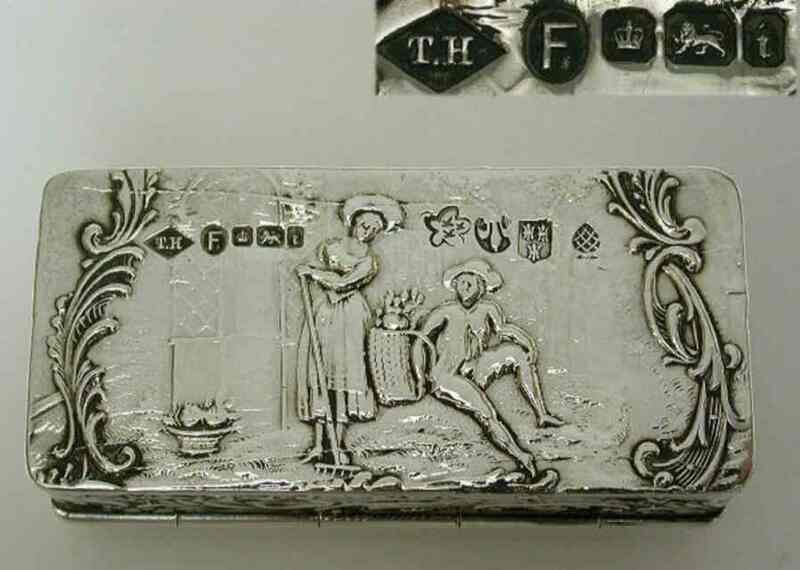 The firm changed its name 1915 to Berthold Miller and was listed as wholesale silversmiths and jewellers, antique reproduction in silver, ivories, miniatures, enamels, and so forth. 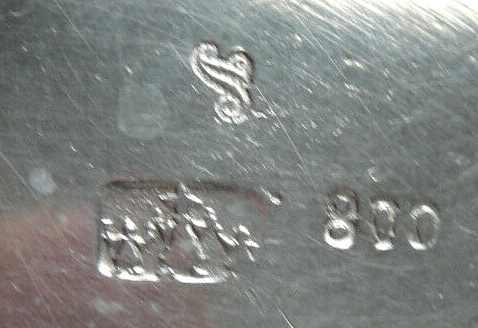 Another importer of Hanau silver was J.G.Piddington which was independent of Berthold Muller and an import firm in their own right, see Culme, page 423 under John George Smith &Co. The shipping and forwarding business was founded in 1849, the firm was a partnership between J.Friend and J. Piddington. The grandson of Piddington, John G.Smith jr. took the surname of his grandfather in 1900. J.G. 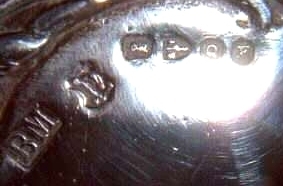 Smith & Co are noted to have imported a great deal of silver, apparently an important part of their business until 1939. 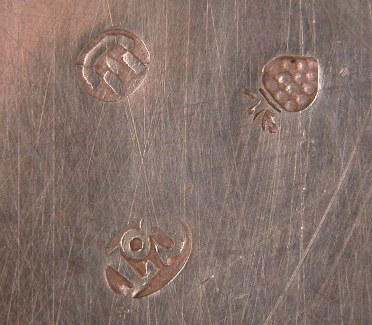 Many of these items, decorative in nature, to be of German origin. A privately printed and illustrated history of this firm exists, called 'Vitesse, The Story of Continental Express', published in 1949.